While there are many people that have contributed to our projects, there are a number of people, suppliers and organisations that deserve a special mention. They have played a major role and truly helped us get to where we are today. It is a collaboration of various people, all working towards a common goal, each contributing their knowledge and expertise towards improving the end result. These people believed in the Green Swing and are as excited, determined and passionate as we are. For our second major development project we selected Sid Thoo as our architect. Sid Thoo is an award-winning architect, educator and consultant helping everyday people realize that eco-effective homes and buildings can be easily achieved, won’t cost a fortune, and are better not just for the environment, but also for the people that live and work in them. Working with Sid is an absolute pleasure; we laugh a lot! Never change a winning team… for our second project we stick with the fantastic services provided by Gary & Anna from Right Homes. Same company that helped us develop our first successful project on 96 Rutland Avenue. The designer we selected for our first project was Griff Morris from Solar Dwellings. Griff Morris was a great match: he is one of the best (if not the best) in passive solar design and lives and breathes sustainability. Griff genuinely believed in the project and stuck with us during the difficult and challenge DA process. His knowledge and expertise were invaluable. A big thank you to the team @ Solar Dwellings! When we met Gary and Anna from Right Homes we knew that they had gained a reputation in the marketplace as a hard working, ethical business, driven by a shared passion of its employees. They had just finished building the first 9-star energy efficiency rated home, which is carbon neutral. But to take on a project with three dwellings, each constructed with different building materials, one of them being straw bales, is a bit different to say the least. Right Homes have embraced the challenge; it is a pleasure working with you all! Josh Byrne is of course well known for his work on the ABC’s Gardening Show and being a WA local, we could not think of anyone better to assist us with the landscaping and integrate the buildings with the garden. Josh was the inspiration behind the community garden proposal for the sump (see below) and his knowledge and expertise were invaluable in getting approval for the shared rainwater system and grey water solution. The local community garden association embraced the proposal to re-vegetate the sump at 98 Rutland Avenue and turn it into a satelite community garden. 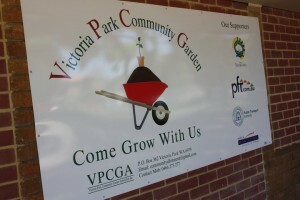 The project is now run as a sub-committee of the VPCGA. We would also like to acknowledge the Town of Victoria Park. Without the support of Elected Councillors and staff, this project would not have been possible.